Every year in the UK over 15 million handsets are replaced or upgraded which works out at the equivalent of over 1700 every minute. That leaves a staggering £500 million worth of unused mobiles simply lying around in people’s homes and offices collecting dust. Rather than collecting old phones or even worse throwing them in the dustbin, why not dig them out and send them into online recycling companies who will dispose of them correctly and pay you cash up to as much as £450 each. There are loads of mobile phone recyclers in the UK who will buy your handset off you and dispose of it correctly. However there can be a huge difference in price between each site for each model of handset. To help you out you can now compare the prices for your old mobiles or smartphones using our handy search facility below. This will compare as many as 50 different recycling companies. Simply enter the model of the phone you want to sell in the search box below and the tool will compare the various prices and recyclers for you. Once you have decided where you want to sell your phone you must register your details on each site and choose your payment method. After doing this they will send you out a sale pack which includes a freepost jiffy bag. If you decide to send your handset freepost you should always make sure you get a certificate of posting. For higher value phones its highly recommended that you use recorded or special delivery so you will be insured if your item goes missing in the post. As well as being more secure using recorded or special delivery means that your goods will get there faster and you will get your money quicker. Once the company receives your old handset the condition of it will be checked by their quality control engineers. If the item is in a good condition then your payment will be processed and sent via your chosen method within 1 – 4 days. If there are any problems then you will usually receive an email containing a revised offer. You can either accept this offer and your items will be processed as normal or decline the offer and have your phone returned to you free of charge. Can I Sell a Non Working Handset? Yes, most online recyclers will accept non working handsets and offer you between 10% – 80% of the working price depending on the condition. Simply select non working on the recycling site and send it off as normal. Once it’s been received and an engineer has checked it over you will normally be sent an offer via e-mail. You can either accept and receive your money as normal or decline and have it sent back to you at no extra charge. If your mobile phone only has mild cosmetic damage, has the original battery, is not water damaged, has a working screen and will switch on then you should send it in, in a working condition. If there are any problems they will let you know. 20% of any mobiles that can be reused will stay in the UK, if you’ve ever received a refurbished mobile phone from an insurance policy chances are it will have been sent in be be ‘recycled’ at some point. The other 80% will be sent to third world countries in Africa, Russia and Asia. The use of mobile phones in these countries is essential for business and communicating with family / friends as there are few landlines available. If the item you sold was beyond economical repair (BER) then it will be broken down for parts. Any precious metals such as gold, silver, platinum or copper will be removed from it and then could be used to make items of jewellery. The plastic casing is melted down to make sheeting or traffic cones. Any parts that are left are used in any ways possible as all mobile recyclers operate a zero waste policy. By giving your unwanted mobile to charity you won’t be earning money for yourself but you will be giving to people who need it most. 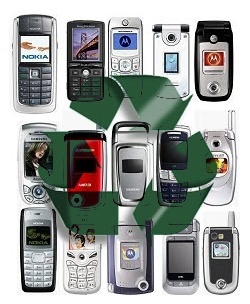 One of the UK’s most popular websites to send your old mobile phones to is Recycle4Charity. Recycle4Charity is a free service where you can choose from hundreds of charities to donate your stuff too. To date they have donated over £600,000 to various charities around Britain. You could also help to promote peace and protect our natural world by donating your old mobile to Greenpeace. Greenpeace works with ShP Charity who have donated over £2 million in the last 6 years to various charities both big and small. You could sell your old mobile or smartphone on eBay. or any other online auction site that you know of. Nine times out of ten you will get more at auction than through the phone buying websites. However you do have to bear in mind that the process will take longer, you may have to deal with unhappy customers and there’s no guarantee that your item will definitely sell. If you are going to sell at auction then you will also find that you get higher bids if you have the original box, the instructions, the charger, all the accessories and the phone is in full working order. Some shops on the high street such as CEX or Carphone Warehouse will offer you a higher price if you are buying a new phone from them anyway. Trade ins only usually apply to fully functional and undamaged handsets. There is a trade-in calculator on the Carphone Warehouse website that you can check to get an idea of the prices you may receive. Its not just about making money there are many environmental issues too. Every year in Europe over 100 million phones are thrown in the bin and end up at landfill. They contain many dangerous and toxic materials including cadmium, lead, brominated flame retardants and beryllium. These materials are associated with human diseases and can cause many problems to the world’s environment. One comment so far - add yours! Recycle4Charity.com is committed to the environment Laser printer recycling, Laser printer supplies, Phone recycling charity and Printer recycle.